My son Jack graduated from High School this week (thank God), and better yet…he is off to college next year! He asked for a lobster bake…he is a Maine boy after all. I wanted it to be an elegant but casual event. 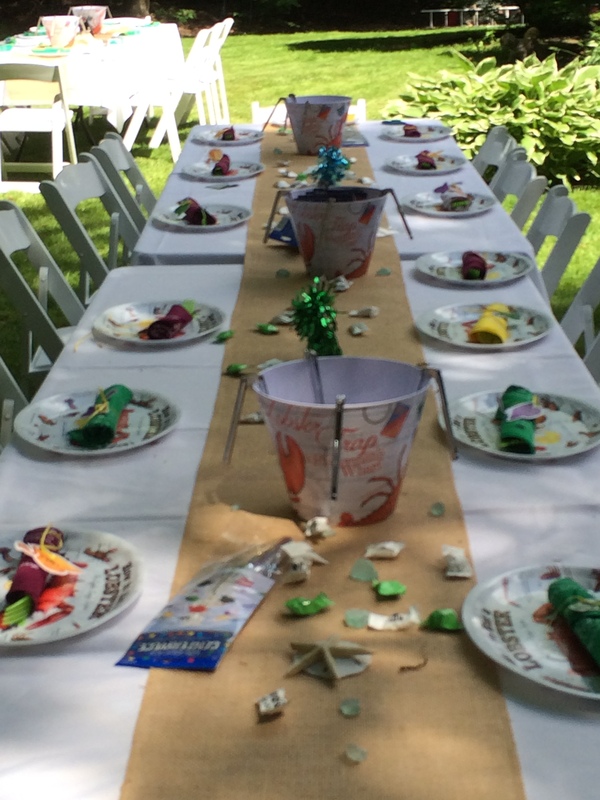 I bought bandanas for the napkins, ‘How to Eat a Lobster’ plates, 14″ wide Burlap ribbon, shells and sea glass to decorate with. 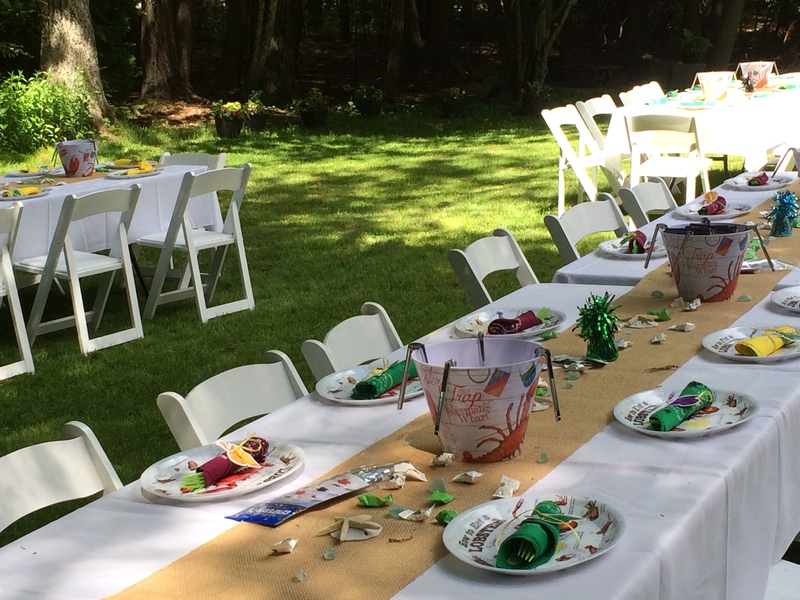 We set up rental tables with white linens, and white folding chairs in the backyard. 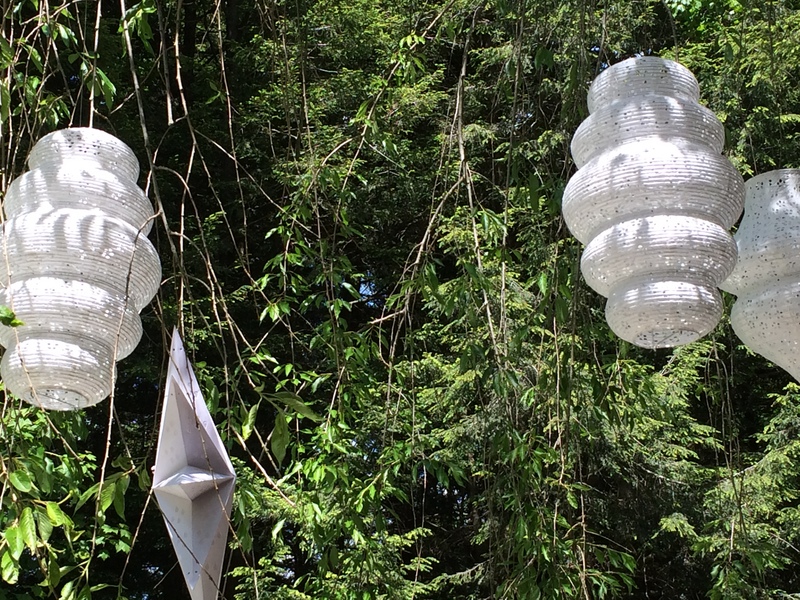 My nephews hung white paper lanterns from the trees. The Menu: Maine lobsters, grilled vegetable kebobs, salad and best of all my sister-in-law Tina, made one of her famous cakes! Edith, my very clever sister, made name cards with “I know Jack is in the room when…” on the top, and each guest filed in something below. They were all very funny and it was a great ice-breaker for the cocktail hour! My wonderful brother Andrew, from California made a video with clips from all of my siblings, nieces and nephews congratulating Jack and telling stories about him. My brother is an incredible web designer, the video was professional and was the hit of the party. One of my clients loaned me a professional/industrial lobster cooker…Thank you Becky! We feel so lucky that our family flew and drove to Maine from NYC, Florida, Virginia and Washington DC to celebrate with us. The Bar: very important on a hot day! We hung 30 lanterns in the backyard and it was magical. At about 2:00 am, (when I was up, thinking about the mess downstairs) I looked outside and my yard was glowing. It was so lovely! We had 40 guests…only 15 of which were not family. 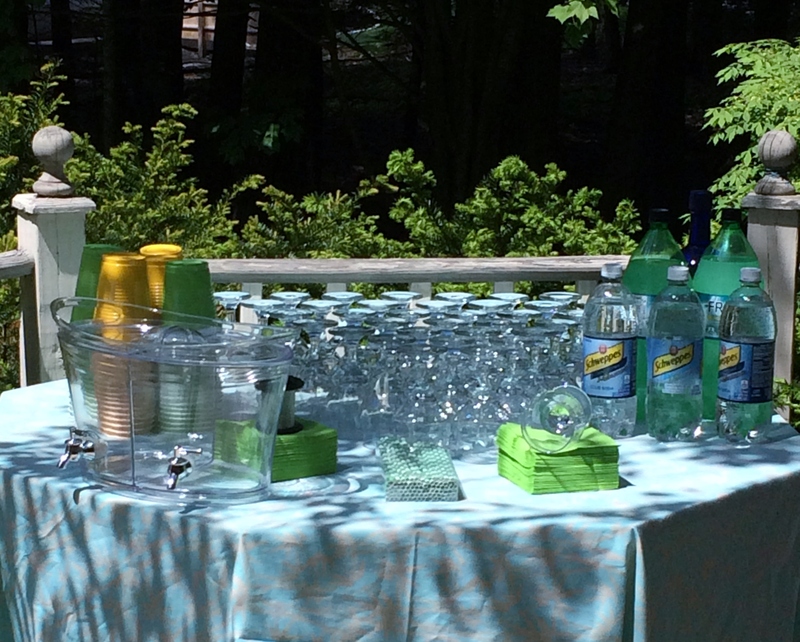 Here is a close up of the graduate’s table. He had such a wonderful time at his party, he thanked me several times…this as we all know is rare for an 18-year-old boy. I hope you enjoyed seeing our party. I am so exhausted, but it is worth it. Thank you for stopping by, I hope you like this post let me know by liking or commenting. Next Post: will be back to interior design! Reblogged this on Lean in with design. Awesome party! Still wondering how Jack can be 18 and graduating!! Congrats, Jack! We wish you the best in your future endeavors. Hope to see you this summer. So cute – Love lobsters. So many great memories of vacationing in Maine as a kid. This will be a party your son will always remember. The lanterns are beautiful!